The Dual Hand Massager has two times the pain relieving action of a deep tissue, shiatsu style massage. This massager is perfect for upper and lower back, shoulders, neck, thigh, calves andmore! Vary the speed and change the massager heads for a variety of muscle-relaxing, stress-eliminating massage options. Stimulates Nerve Ends By Reflexology Therapy. Promotes blood circulation and body metabolism. Applicable for all the parts of the body Relaxes muscles from tiredness and the pain of nerve With speed adjusting function. 1. Streamlined design, light and nice. 2. Dual Hand Massager can massage every part of our body. 3. Reduces pains caused by fatigue or rheumatism. 4. Eliminates spasm in the shoulder and Lower Back. Dolphin Dual Massager comes with three attachments which help to stimulates pressure points and relaxes the stiff of nerves and muscles. It eliminates the uncomfortable feeling of fatigue, poor memory, appetite and drowsiness. 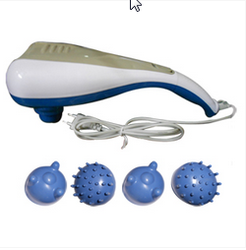 This dual massager helps in promoting metabolism of body and blood circulation. It is applicable for physiotherapy of all the parts of body. It provides many health benefits such as relaxing tired muscles & eliminating the pain, reducing the pain which is caused by rheumatism and fatigue. Dolphin Dual Massager comes with interchangeable massage heads and a streamlined design, light and easy to use. HEALTH BENEFITS OF DUAL HAND DOLPHIN : Dolphin Dual Massager provides many health benefits such as relaxing tired muscles & eliminating the pain, reducing the pain which is caused by fatigue and rheumatism.